An ultra-high-vacuum chamber with temperatures approaching absolute zero—the coldest anything can get—may be the last place you would expect to find gold. But a group of researchers from Stony Brook University (SBU) in collaboration with scientists at the Air Force Research Lab (AFRL) and the U.S. Department of Energy's (DOE) Brookhaven National Laboratory have just demonstrated that such a desolate place is ideal for producing catalytically active gold nanoparticles. A paper describing the first catalyst ever produced using their new method, called Helium Nanodroplet Deposition (HND), was recently published in the Journal of Physical Chemistry Letters. As lead researcher Alexander Orlov of SBU explains, HND works by boiling gold atoms in a vacuum to produce a vapor. The vaporised gold is then "picked up" by an extremely cold jet stream of liquid helium droplets that act to literally strike gold clusters against a solid collector downstream. 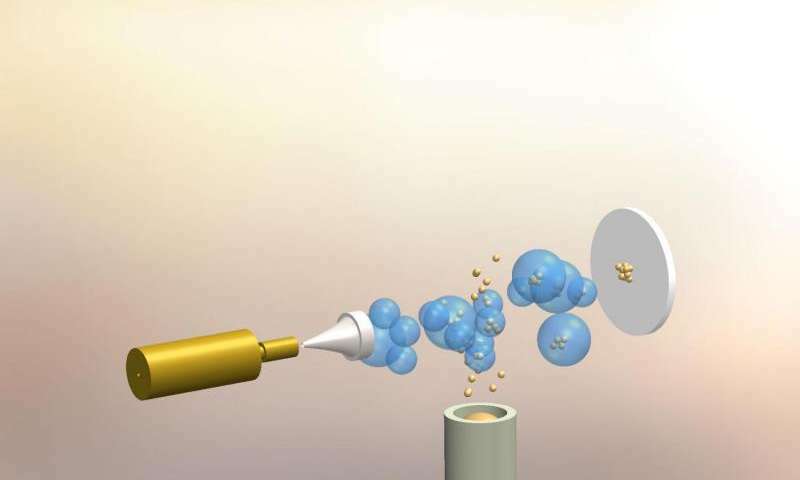 Upon striking the collector, the liquid helium droplets instantly evaporate releasing helium gas and leaving behind unprecedentedly pure and stable gold nanoparticles. "This new method to produce active nanoparticles offers unique opportunities to create materials with unprecedented properties to solve energy and environmental problems," Orlov said. "Our Brookhaven and AFRL collaborators made it possible for our students to access the most unique facilities in the world, which made all the difference in our research." Qiyuan Wu, a graduate student working in Orlov's laboratory and first author on the paper, performed much of the work to develop the method. Michael Lindsay and Claron Ridge of AFRL provided state-of-the-art facilities at Eglin Air Force Base, one of only a few places in the world with the capabilities required to generate the gold nanoparticles using the new technique. And a team at the Center for Functional Nanomaterials (CFN), a DOE Office of Science User Facility at Brookhaven Lab, used advanced imaging and characterisation tools to study the nanoparticles' catalytic activity. Specifically, Brookhaven scientists Eric Stach and Dmitri Zakharov of the CFN and Shen Zhao, then a postdoctoral fellow working under Stach, developed a method to deposit the gold nanoparticles onto a "catalyst support" structure they use for characterising the stability of other nanomaterials. They then studied the characteristics of the nanoparticles, including their stability under reaction conditions, using the Titan Environmental Transmission Electron Microscope at the CFN. Further characterisation by Zhao and CFN staff member Dong Su using aberration-corrected Scanning Transmission Electron Microscopy allowed the SBU researchers to understand how the droplets form. "This was part of a User project, that morphed into a collaboration," said Stach, who leads the electron microscopy group at CFN. "It was a very nice study"—and an example of how the Office of Science User Facilities offer not just unique scientific equipment but also scientific expertise that can be essential to the success of a research project. Nanoparticles are of high research interest due to their improved properties compared to bulk materials. They have revolutionised technologies aimed at improving sustainability such as fuel cells, photocatalysts, and solar panels. 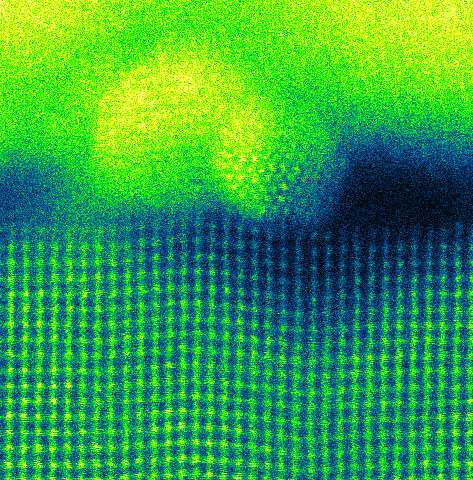 The gold nanoparticle catalysts produced in this study are capable of converting poisonous carbon monoxide gas into carbon dioxide gas, an essential reaction that occurs in the catalytic converters of cars to reduce pollution and lower impacts on the environment. According to Orlov, the HND method is not limited to the production of gold nanoparticles, but can be applied to nearly all metals and can even produce challenging multi-metallic nanoparticles. The technique's versatility and ability to produce clean and well-defined samples make it a powerful tool for the discovery of new catalysts and studying factors that affect catalyst performance. The collaboration is currently researching how the parameters of HND can be adjusted to control catalyst performance.